Let me tell you a little bit about The Loft. In 1982 I painted my first piece of wooden folkart. I fell in love with country folkart and could not wait to create the next idea that popped into my head! I bought a band saw and went crazy. When the thrill of creating and selling became so paramount, I started and named my business The Loft. The back of our house is a 170-year-old log cabin that homesteaded the Brugh land. The goal was to make the cabin a retail store and my studio would be in the loft, thus the name. I have done home parties and open houses with my country folkart. 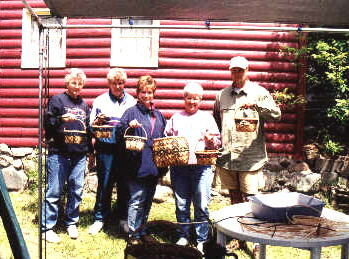 I have been interested in baskets for over 30 years and I was able to take my first class in 1985. I became obsessed with basketmaking, as we all can understand. 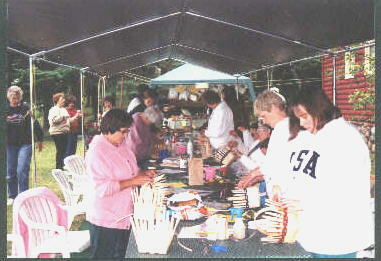 Woodcraft went by the wayside and baskets took over. I missed the wood, so I began to combine wooden country folkart with my baskets  tie-ons, swags, and later our Homespun-Ds© and Country-Ds©. Also, we started wiring our version of ceramic and wire handles that compliment the folkart and baskets. On our website I bring you "Country From Me To Thee" with country accessories and handles and also my original patterns. You will also see other artists' patterns on our website using our handles. At this time orders may be placed by email to ronda@theloftbaskets.com or by regular mail to: The Loft, 3118 N. 600 W., Rochester, IN, 46975. These addresses will work for the summer also, when we are at our cabin in Minnesota. Our phone number in Indiana is: 574-223-6902. In Minnesota the cabin number is: 218-682-3277. I have taught basket classes in Indiana, Missouri, Kentucky, North Carolina, and at our cabin in Minnesota. In MN we do this under our canopy (pictured above) by the lake during July. We vend at the Stateline Friends retreat in Indiana, the Woven Together in Western Kentucky Weaving Retreat, and at the Michigan State Convention. Do stop by and meet us. We would love to say "Hi!". Basketmakers are a unique bunch of loving, caring and sharing people. We are very content being part of this group. We hope that you will bookmark our site and come back to visit us often.